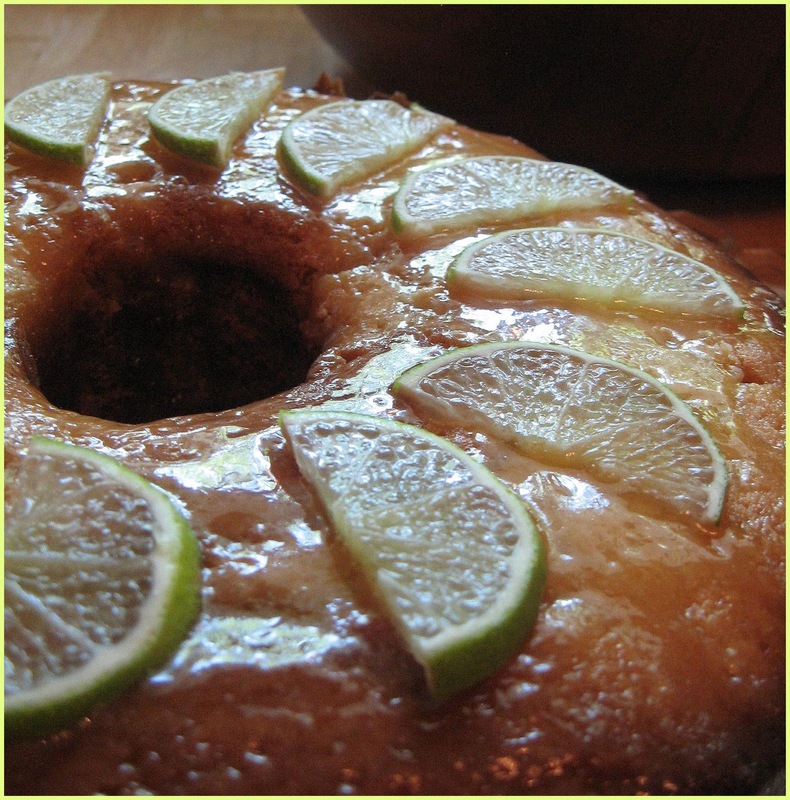 Ladies and Gentlemen, get out your bundt cake pans for this tart tribute to the tiny south Florida key lime.Tart yourself up and get baking! Now serving....a deliciously moist, not your typical pound cake, tart and tangy cake smothered in a gluttonous key lime caramel glaze. It is a breakfast, lunch, or dinner cake. Top with fresh cream and those wonderful July berries. If you are expecting your typical dry pound cake that is ready to soak up the sauce...this is not the cake for you. This cake turned out mmmmmmoist. Very moist. 1/2 cup key lime juice - I picked up a bottle of Nellie and Joe's Famous Key Lime Juice and it is really good. 1/4 cup soda like, sprite, 7 up or something light and lemony and fizzy. Start you oven - bring it up to 325 degrees. Grease and flour your bundt/tube pan. Whisk your dry ingredients together in separate bowl.Cream butter and add sugar, vanilla and one egg at a time, nice and slow until all mixed in. Don't forget to scrape your bowl and bring up the ingredients that tend to get stuck at the bottom. Add in lime peel and slowly add in your flour salt mixture alternating with your liquid. Scoop your batter into your pan and place in oven. This cake takes a long time, it was around 70 minutes. Get yourself some nice long skewers to test the cake with. Nobody wants a cake that is underdone. It will be nice and brown on top. Let cake rest for about 10 minutes and then pop out onto your cooling rack, careful as cakes are fragile beings. Poke holes in cake. Melt butter and sugar and lime juice in heavy bottomed pan. Let boil just until you see the color start to change... it will start to brown a bit. This takes a while, around 5 minutes. We are not going for full on caramel thickness.... but close. Add in whipping cream and continue to stir and boil for another minute or so. Take off burner. Gently pour over your cake. You will want your cake on it's serving tray now so it can sop up the glaze. Top with sliced limes and serve with fresh whipped cream and berries. I don't think you understand how much I love pound cakes, especially citrus-y ones. YUM! I love lime flavored cakes! This one looks amazing. 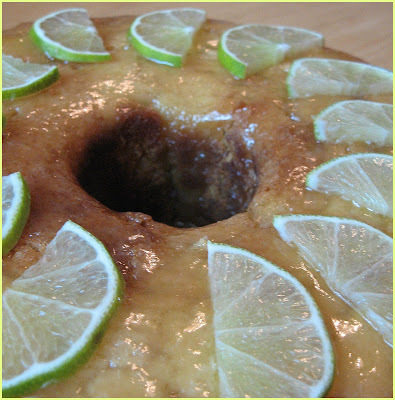 I especially like how you incorporated the lime on the top for decoration, very summer festive. Belinda! I love citrus as well, always so zippy! It heals the mood! This does look moist. I have not made cakes in a while. Maybe it time to make one. What a refreshing idea! I've had and loved plenty of lemon pound cakes, but this must taste like something extra special. My boyfriend's favorite cake of all time is a key lime pound cake you can only find at this one particular bakery. I will definitely be giving this a try! I see no way that this can't at least rival that one. Congrats on top 9! Wow, that is a gorgeous cake! And I love citrus flavors - limes are very popular here in Brazil. Thank you all for the delicious food ♥♥♥! The cake was delicious, much better the next day as any pound cake is. @ Patricia... how nice to live in Brazil and have all those tropical flavours at your fingertips! 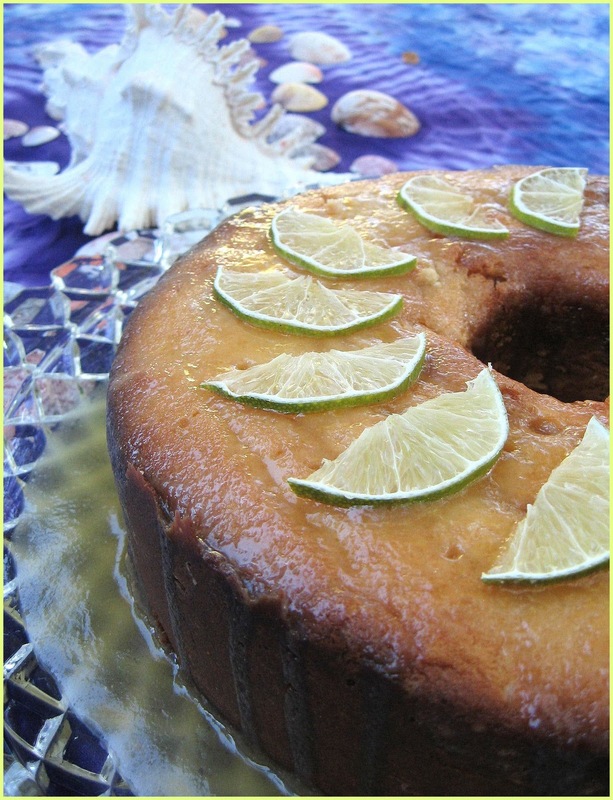 @Biren - I keep remembering an orange cake that you made... always on my mind. If I made this I would eat the whole thing. Period. This looks amazing.